"Climate Victory Gardens" were inspired by the "Victory Gardens" planted during the first and second World Wars. By 1944, nearly 20 million victory gardens produced eight million tons of food, equaling over 40 percent of the fresh fruits and vegetables consumed in the U.S. at the time. These victory gardens fed Americans at home, to make more farm-raised food available for the troops abroad. "We have communities nationwide that are food prisons that could be producing their own organic food while addressing climate change. By educating the public about regeneratively homegrown food, Climate Victory Gardens are raising awareness about one of the biggest global challenges of our time and showing Americans how they can make a difference for themselves, their households, and their communities. Soil Equals Life." 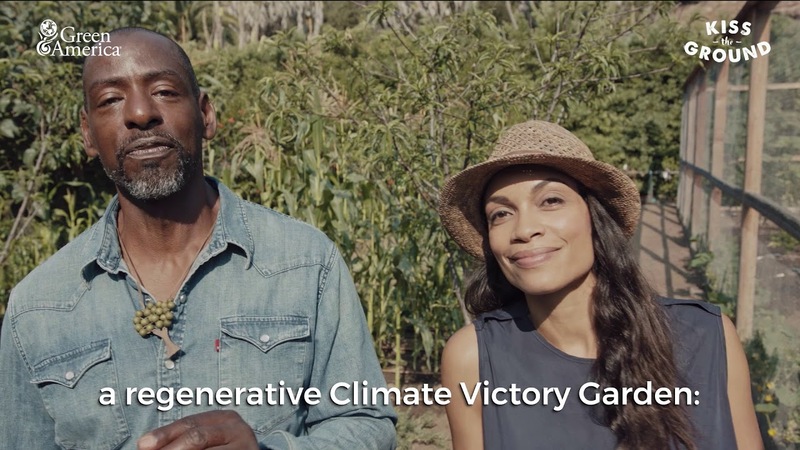 A very special thanks to Green America, Rosario Dawson, Ron Finley and the Ron Finley Project, our amazing film crew and to Kellogg Garden Products for their support in bringing this video to life—and thank YOU in advance for helping us share this video and supporting the regeneration of our planet, one garden at a time.